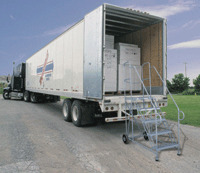 The Trailer Access Ladder offers easy entry to tractor and cube vans in places where loading docks and bays are not available or convenient. 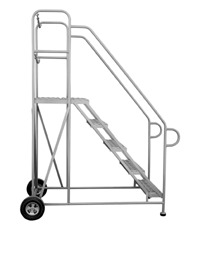 The 5 step (50" top step height) ladder moves easily on (2) 10" semi-pneumatic rear wheels and is provided with slip resistant heavy duty grip strut treads. 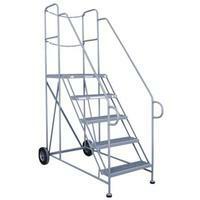 The easy 50 degree climbing angle permits forward descent to comply with ANSI standards. Steps and platform are constructed of heavy-duty non-slip grip strut, supported by 1" O.D. tubular frame. 48 Hour Shipping: Four manufacturing locations to serve you and reduce shippping costs California, Michigan, Texas and Georgia. ZORIN will provide you with a freight quote via email prior to processing the order. Please call (888) 378-6525 with questions.